The first person mentioned in the Torah for her challah making skills was Sarah. The commentaries go on to say that her challah (a braided bread served on the Sabbath and holidays) stayed fresh and warm from week to week. After her death, those miracles disappeared until Rivka (Rebecca) came into her tent. One of the ways Isaac knew Rebecca was the right girl for him was the return of the miracles of his mother. Today, we rely on freezers, bread makers and our good friend, Kitchen Aid, to help us make tasty challahs. I hope Sarah would approve! I make challah for our shalosh seuda (third meal of Shabbat) because I want to make enough to recite the special blessing that goes with baking it. When I make it at our shul, I also make sure to use Yoshon (flour that is not from a recent wheat crop) because an individual in our community observes that particular mitzvah. I like the large Kitchen Aid mixer the shul has, and since I lead a very boring life, it is a thrill. I usually make about 10 challahs at a time, and freeze them. I do this on a monthly basis. When I bake for my family, I use a bread maker. This is the recipe people ask me for. It is my adaptation of the Sharon Strassfeld challah adaptation from the First Jewish Catalog. 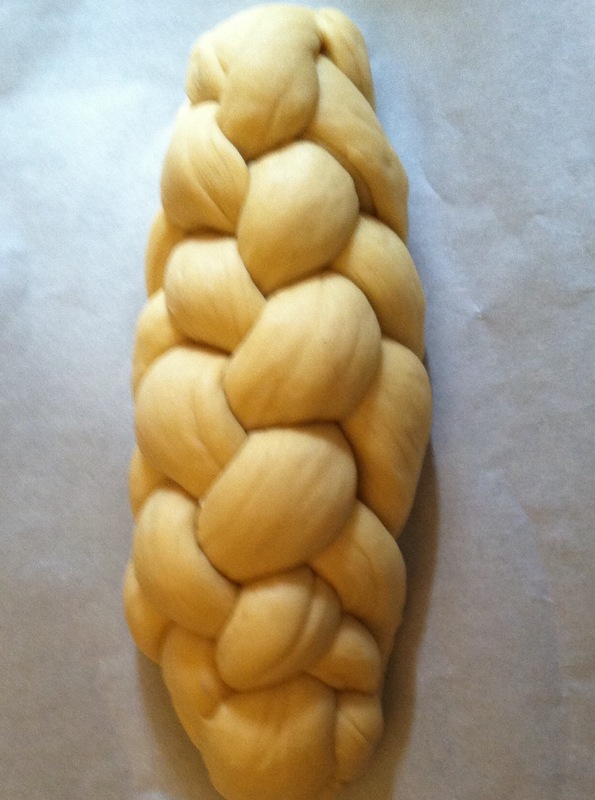 It makes one nice size challah. When my family (there are six of us) is through, there isn’t a crumb left. If we have guests, I have to have more than one loaf. 1/2 teaspoon vanilla (yes, I know vanilla is not a traditional ingredient). Place the water, sugar and yeast in the bowl of the breadmaker. Let this mixture proof for a few minutes. In a large bowl combine the flour and cut the margarine into it with your fingers or a pastry cutter. Add the salt to this mixture. Check the eggs and save the yolk of one of the eggs for the glaze. Add the 1 1/2 eggs and flour to the bread machine bowl and add the honey. Start the machine on the dough cycle. Check the dough from time to time and add a little bit of water or flour as needed. When the cycle is finished, braid the dough. I use a six braid, but a four braid is lovely too. If you want to learn a four or six braid, visit my dear friend, Youtube. There are several excellent videos. My favorite is Maya. It is the one I used to learn how to make a six braid. Place the challah on a parchment lined cookie sheet. Let it rise at least an hour or more in a draft free place. Mix the egg yolk with a little water and “paint” your challah. Top with sesame or poppy seeds if desired. Bake in a pre-heated 325 degree oven until it is a lovely brown.